Vumanity is a branded social video production platform that puts the power to easily and economically create professional quality talk show content into the palm of your hand. 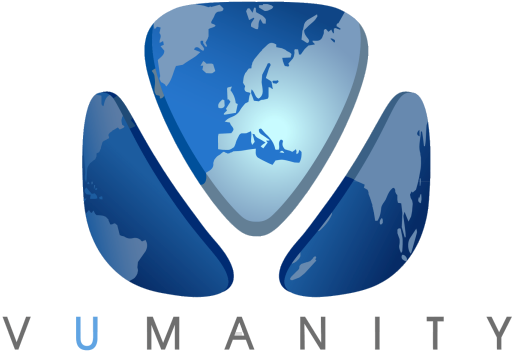 Vumanity enables users to create broadcast quality talk shows using the high definition cameras on computers and iPods, iPads and iPhones. Shows are ready in minutes for rapid deployment via internet distribution channels. The ‘secret sauce’ of Vumanity is a patented cloud-based video production platform that automatically assembles video messages and conversations into custom branded or themed video wrappers to create social video content (people talking to people) that can be distributed most anywhere via the internet. Vumanity is not a live or streaming video chat platform. Instead, video is recorded via mobile device or webcam, which is then uploaded to the Vumanity platform for automated editing into branded full motion video wrappers that are ready for distribution just minutes later. This basic functionality is at the heart of every Vumanity application. Convenience. Hosts and guests can be located most anywhere in the world. No expensive equipment required. Vumanity operates on mobile iOS devices, and PC/Mac computers with webcams. High quality video and audio. Finished videos approach broadcast quality, and are ideal for internet use. Editing speed. Talk shows are automatically assembled in just minutes into a selected video wrapper with participant names, show title, and dynamic switching of the person speaking to the main window. Social media ready. Finished shows in MP4 format can be easily shared on social media channels, or directly with recipients while inviting video feedback when desired. Custom integrated video branding. Vumanity creates custom video wrappers that include intros, outros, and other professional design elements, giving shows a professional branded appearance like you’d see on television. Lowest cost. Vumanity is simply the world’s most economical way to create high quality talk show style branded social video content. Vumanity can be licensed, white labeled in a branded app, integrated with any video distribution platform, or used to produce a limitless variety of content for consumers, brands, and organizations. Contact us to discuss your needs and schedule a demonstration.